Ryan is a business litigation lawyer who focuses much of his practice on consumer class action defense. 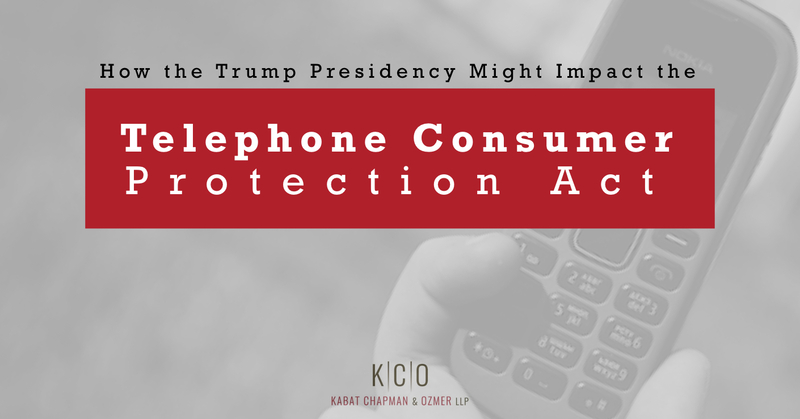 One statute that has seen a dramatic increase in class action litigation is the Telephone Consumer Protection Act (TCPA). In this article, Ryan discusses how the Trump presidency might impact TCPA litigation. The TCPA regulates certain types of communications to consumers, including telephone calls and text messages to cellular phones that are made without the consent of the called party, using an automatic telephone dialing system (ATDS) or a pre-recorded or artificial voice. In June 2015, the Federal Communications Commission (FCC) issued an omnibus declaratory ruling, purporting to interpret various provisions in the TCPA, such as what constitutes an ATDS and how and when consumers may revoke their consent to be called and texted. The FCC’s 2015 ruling has contributed significantly to the recent explosion of TCPA litigation, including costly class-action litigation. Trump Will Appoint FCC Commissioners, Who Interpret the TCPA. The FCC has five commissioners, all of which are appointed by the President and serve fixed terms of five years. At all times, the commission may only contain three members of one political party. Until recently, there were three democrats and two republicans on the commission. However, Commissioner Wheeler (a democrat) is expected to step down on inauguration day and Commissioner Rosenworcel’s (also a democrat) term ended on January 4, 2017. This means the balance of power on the Commission will likely swing three-to-two in favor of the republicans in early 2017. We can expect that Mr. Trump will appoint FCC commissioners who will share the views of the two sitting republican FCC commissioners. This could result in regulatory changes that, for example, narrow the current interpretation of what constitutes an ATDS and expand the existing one-call safe harbor for calls to a wrong number. In fact, commissioner Ajit Pai is the alleged frontrunner for the Chairman position after Commissioner Wheeler steps down in January. Mr. Pai is one of the commissioners who dissented from the majority’s conclusions in the 2015 declaratory ruling. Moreover, Jeff Eisenanch, Mark Jameson and Roslyn Layton are reportedly serving as advisors to the incoming administration on FCC issues, and all three favor de-regulating the communications industry. Although Mr. Trump has not yet publicly commented on his legislative intent with respect to the TCPA, he has repeatedly stated that he intends to roll back regulation. There are a couple of reasons the TCPA (and the regulations enacted under it) may eventually make its way onto this list. First, Mr. Trump’s presidential campaign is currently a defendant in a class-action TCPA lawsuit. This may have left the President-elect with a bad taste in his mouth for the TCPA. Second, while there is good reason for placing limitations on certain mass, autodialed telemarketing campaigns to un-consenting consumers—the original intent of the TCPA—the FCC has interpreted the statute in a manner that is inconsistent with that intent. This has unnecessarily increased TCPA-compliance and -litigation costs for companies, and hampered communications that consumers want (such as autodialed informational calls). Accordingly, the TCPA and its interpreting regulations could be good candidates for reform. What could those changes be? It is difficult to say. However, given the positions Trump’s campaign has taken while defending its TCPA lawsuit, Trump could push for (among other things) an amendment that legislatively clarifies that an ATDS includes only equipment that actually uses a random or sequential number generator to create lists of numbers and then dials from those lists, as opposed to equipment that has the capacity to be modified for such purposes. One thing is for sure: If Mr. Trump takes aim at the TCPA—with majorities in the House and Senate—he could likely push significant changes through. In 2016, the U.S. Supreme Court issued its long-awaited decision in Spokeo, Inc. v. Robins, holding that a consumer must have a sufficiently concrete and particularized injury to have standing to sue in federal court for violation of a statute. However, the Court did not provide much detail as to what constitutes a sufficiently concrete and particularized injury. It is therefore likely that this question will make its way back to the SCOTUS within the next few years, potentially in a TCPA case. In the meantime, circuit and district courts will continue to see a wave of motions to dismiss TCPA claims for lack of standing. We may see that Trump’s appointments are sympathetic to such motions. Many TCPA lawsuits arise out of a relationship between a consumer and a company that is governed by an arbitration agreement with a class action waiver. There is a split emerging in the circuit courts as to whether class action waivers in consumer arbitration agreements—at least in the employment context—are enforceable. We can expect more circuit courts to take up this issue within the coming months and years, culminating in a case that makes its way to the SCOTUS. Trump’s conservative appointments may be more likely to enforce such agreements. Our team will continue to monitor developments that could impact TCPA litigation as the President-Elect prepares to take office. Connect with us on Twitter and LinkedIn for the latest news.